I wasn’t thinking about the significance of the date when I made an appointment for December 31 on the Upper East Side. It was only when I was en route that I realized that to reach my destination, I had to change trains at Times Square. It was still early in the day, but the place was already a madhouse. She was, of course, correct, and as soon as our meeting concluded, I made a hasty retreat to Brooklyn, where I spotted this reveler on Montague Street. Happy new year! 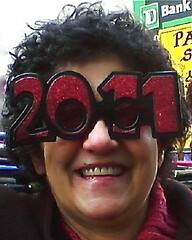 You are currently browsing the Blather From Brooklyn blog archives for January, 2011.